An apparent New World Order (NWO) numbering of the world’s population is in the works, which will affect and impact every human being on the planet from the first day of birth forward! Below is a schematic of their ‘game plan’. 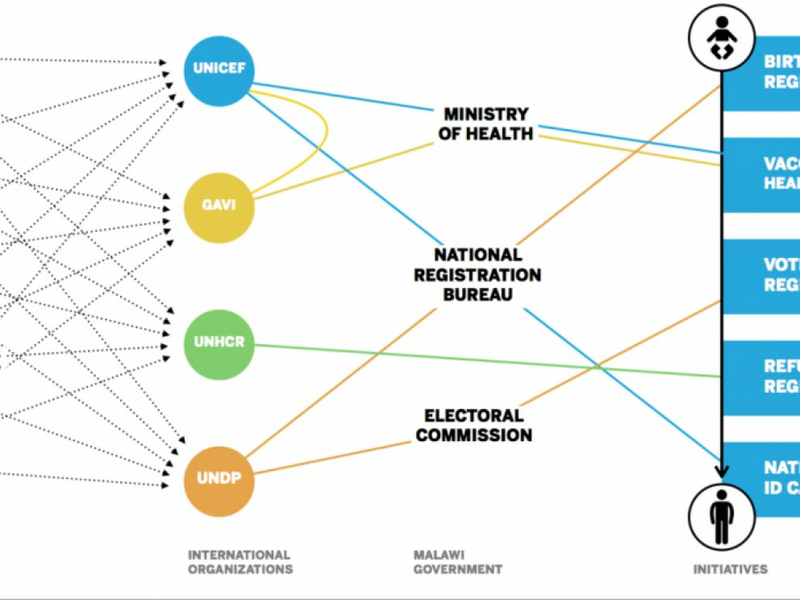 It’s called the “ID2020 Alliance” and is the most comprehensive surveillance database probably to date and being implemented on a GLOBAL basis, as you can see from the International Organizations involved, governmental agencies feeding it statistical data, and the countries that will fund it. If you look closely, you realize the importance vaccinations will play in that Alliance and the apparent role(s) Big Pharma will take in providing ever-increasing numbers of vaccines, which probably will never see legitimate scientific testing for safety and/or efficacy! The other thing that jumps off the page is the apparent close relationship between GAVI and the UN’s UNICEF! The above brings to mind Bill Gates infamous statement made during his February 2010 TED Talk when he gave his famous equation for global population control, which definitely included the use of vaccines. ID2020 Alliance probably is a NWO game plan to effectuate mandatory global vaccinations so the transhumanism agenda can be fast-tracked more readily, since many of the neurotoxic ingredients in vaccines adversely affect human DNA. Plus, check out the UN’s Agenda 21 and 2030, if you haven’t done so already. Committed to improving lives through digital identity. Folks, if you haven’t realized it yet, the digitalization and technological pushes can, and probably will, make life unbearable. Acceptance of all that technology everyone thinks is so fantastic has now become the albatross around everyone’s neck; you no longer will be your own person; you will be owned by technology! What happens if you don’t want to comply with all the toxic vaccinations, etc.? Well, remember what the CDC did in 2016, and which I wrote about? An Epic Rulemaking Comment Period Regarding the CDC’s Power Grab Ends October 14, 2016 – What Is Your Position About Its Infringement Upon Your Health? An EPIC Rulemaking Comment Period Regarding the CDC’s Power Grab Ends October 14, 2016 – What Is Your Position About Its Infringements Upon Your Health? However, there’s a most interesting aspect to many of the newer vaccines being created – close to 300  – by Big Pharma, I offer. Many aren’t for communicable diseases, but for diabetes, cancer vaccines, peanut allergy vaccine, etc. Shouldn’t Congress be investigating the CDC/FDA’s ‘charter’ as to why both those federal agencies seem to be overstepping their charters and powers regarding and recommending vaccines, since vaccines originally were implemented to “prevent communicable vaccines,” which, in fact, they contribute to spreading by what’s called vaccine shedding [2-3]? There definitely is some apparent other agenda with regard to vaccines and their toxins, especially since the CDC exercised a hugely anti-Constitutional federal agency over-reach in 2016 when it mandated everyone be quarantined or jailed without legal representation for not taking vaccines and even fined up to $500,000! CDC seems to be operating like a rogue agency with total disregard for any oversight, which is nothing new for it or, more specifically, for the FDA. Here’s proof as published in the monograph Vaccines & Vaccinations: The Need for Congressional Investigation January 2011 Presented to the 112th Congress Oversight Committees, edited by Laraine Abbey-Katzev and Catherine J Frompovich. 1 Emord, JW. Global Censorship of Health Information (Washington, DC: Sentinel Press, 2010) 16. Besides the new Travel IDs U.S. citizens will need effective in 2018 per Homeland Security , you now will be identified in a database as a “citizen of the New World Order”.